Birthrights by J. Kyle McNeal. Elevate Fiction, 2017. Paperback. 552 pages. 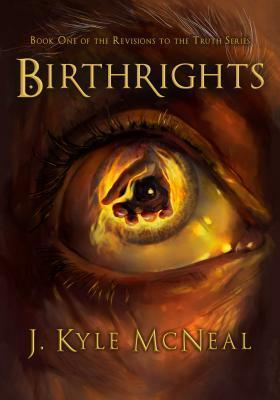 Birthrights is the first large installment in a new epic fantasy series from J. Kyle McNeal. I didn't really have any expectations going into this book, but I was still impressed by the vast, immersive world that this book encompasses. This book contains a vast, intricately detailed world that really took me a little while to get into. The story starts off with interesting enough events that immediately piqued my interest, but the exposition and world-building elements were a bit slower to unfold, and in turn made me unsure of where this book would go. Fortunately, I eventually caught on to what was happening and things started to pick up as the book continued. McNeal takes his time with his prose, which allowed me to fully appreciate the complex world of the Lost Land that McNeal developed, and I really look forward to finding out more about it in subsequent books. Birthrights follows a few different perspectives, but the main two are that of Whym and Quint. These two characters both come from very different backgrounds, but end up having similar situations in life in which they must questions what they are doing, what their motivations are, and what they must do in the future to make the right decisions. Whym is from a disgraced family and becomes an apprentice to a man who has a rather bitter past with Whym's family, which thus causes controversy among many people in his town, including his parents. Quint, conversely, is a high-born son of a powerful family. He is thrust into the position of being an advisor to the Dragonborn tribes, a task that is not without its challenges. I felt that both of these characters were drawn extremely well and were wonderfully dynamic. There are many other characters in this book as well, but since there are a lot of them I will leave them all for you to discover for yourselves. They are also developed well, though they weren't all as well-developed as I would have liked. I will say that I was personally a bit intimidated by the abundant number of them at first, but as I said before, once you get a grip on this world, it becomes much better. In addition to the strong characters and world-building, there is also a lot of strong political intrigue and an emphasis on the themes of purpose of existent, motivations in life, and many other deep topics. I really appreciated how well these topics were worked into the story and added some extra layers of depth to the book. The only issues I had with this book was that it did seem to drag just a bit at various moments. Sometimes I felt that there just wasn't enough going on or too much exposition/info-dumping for me to be fully immersed at all times. Similarly, some of the chapters were incredibly short and jumped back and forth between characters really quickly, which was also somewhat annoying at times to have to switch back that often, and I wish that the titles would say whose perspective we were looking at right away. This is a darker fantasy with much violence and mature topics, so just be warned before you start it. I'm not typically bothered by harsh topics (unless poorly written), so I had no issues with this, but I find it helpful to inform readers of this. Overall, I've given Birthrights four stars!